As Nato members met to rally forces in the Libya operations, Russia kept up pressure on the alliance to adhere to its UN mandate. Old concerns about missile defences were close behind. At a Berlin meeting of Nato foreign ministers, Russia reiterated its stance that the western alliance’s Libya campaign has overstepped its UN mandate through use of excessive force. It also pressed home concerns in the ongoing issue of missile defences in Europe. “We consider that certain actions by Nato in Libya do not correspond to its mandate, and we would like to investigate this,” Sergey Lavrov, the Russian foreign minister, said after Friday’s talks. Participating in the framework of the Russia-Nato Council, Mr Lavrov added that he had requested that the Nato leadership strictly observes the positions on Libya adopted by resolution 1973 of the UN Security Council. Russia saw the Nato action as a real-life litmus test of that organisation’s new strategic conception and its readiness not to overstep its authority as defined by the UN, Mr Lavrov told ministers from Nato’s 28 member states and leaders of allied nations. Russia, which has power to veto UN resolutions, abstained from last month’s vote that authorised the airstrikes by Nato. The Russian delegation expressed satisfaction that the first report by Nato General Secretary Anders Fogh Rasmussen on the implementation of Libya-related resolutions had been delivered to the UN Security Council. Regarding the planned development of a European anti-ballistic missile defence shield, a major sticking point in relations with Nato, Mr Lavrov underscored Moscow’s basic position: all participants in the project must agree on criteria guaranteeing that the system will not be directed against any of them. Russia also wants guarantees that Nato’s military planning will not threaten its interests. The meeting in Berlin also failed to allay Russian apprehensions about Nato plans to adopt a “stage-by-stage adaptive approach” in developing a European shield. In the opinion of Russian military experts, the anticipated appearance of missile interceptors near Russia’s borders within 8 to 10 years under current plans would create potential risks for its intercontinental missiles. It remains unclear to what extent the alliance and the US are willing to involve non-Nato members like Russia in work on the system. 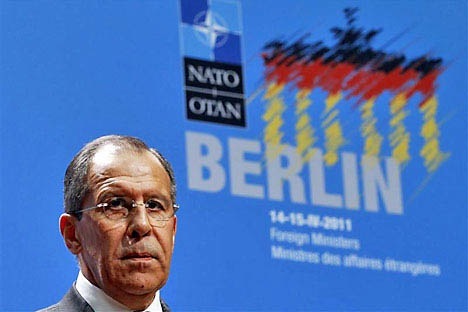 After the Nato-Russia Council meeting in Berlin, Mr Lavrov said talks about the possibility of Russia joining the European system of missile defence are being conducted not only with the alliance, but also in Washington. The ministers in Berlin affirmed renewed efforts to fight terrorism. Actively being promoted is a joint Russia-Nato programme to develop remote identification of explosives carried by suicide bombers. For Afghanistan, the sides agreed to create a special helicopter fund to help raise the qualifications of Afghan personnel who service flight equipment.